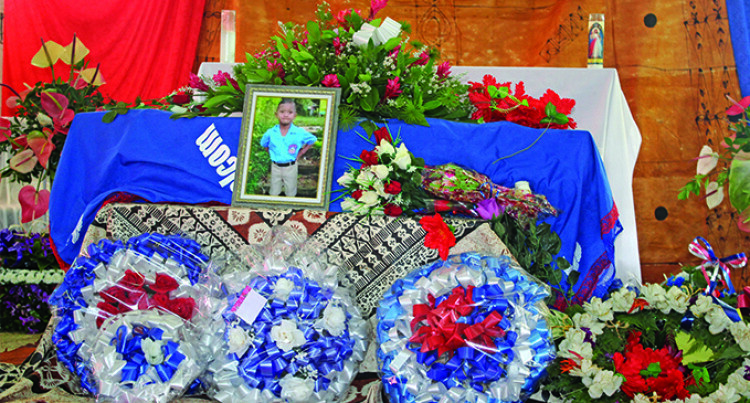 Young Malcolm Makasiale had a home going service in the school hall at Marist Brothers Primary School yesterday. Head boy Joseph Mow said it was sad to have lost a student, especially as they had just begun the school year for 2019. Ms Elisabeta Roseru, the Year 1 teacher, said she was in the classroom when a parent had relayed the news to her before confirming the news from the office. “I informed the rest of the Year One students about the shocking news at the end of the day (Monday),” she said. “Malcolm was a very cheerful, talkative and very knowledgeable young boy who was always eager to learn,” said Ms Roseru. “It is very sad indeed because we are still shocked with the passing of one of our bright students. “Losing a child is an unforgettable experience because they have lived and left their footprints in our hearts. The teacher shared that Malcolm Makasiale had wanted to become a soldier. Malcolm will be sorely missed by his family, friends, and classmates. The casket left the hall at 4pm to Lovonilase Cemetery for his final resting place. The late Malcolm’s parents were too emotional to comment. Meanwhile, the students that were at the scene are undergoing counselling by Catholic Church counsellors.